Ezio Auditore da Firenze is the main character from Ubisoft's Assassin's Creed video game series. 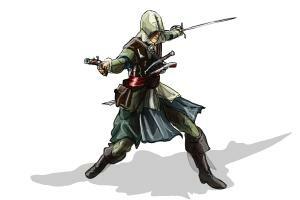 The character first appeared in 2009 in Assassins Creed II. Here is how to learn how to Draw Ezio Auditore da Firenze from Assassin’s Creed. Step 1: We’ll begin by outlining his torso, arms, and head. Step 2: Next, we will start laying out the design of his cloak and clothing. Once that is finished, it is time to create layers of detail. Fill in the lines of his face, along with the outline of his hood. Be careful when adding detail around his cloak, as there are a lot of detailed trim around his cuffs. Step 3: The finishing touch is applying color to the different layers, and that’s how easy it is to draw Ezio Auditore da Firenze from Assassin’s Creed.